A powerful and versatile light sensor that measures light in the visible to ultraviolet electromagnetic spectrum. 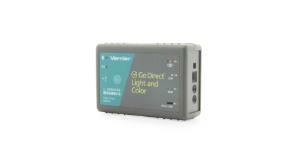 The Go Direct Light and Color Sensor combines the power of multiple sensors to measure light intensity in the visible range, UVA, and UVB portions of the electromagnetic spectrum. Ideal for experiments using UV lamps, the UVA sensor responds primarily to UVA radiation (peak response at 365 nm). Our Go Direct™ Light and Color Sensor connects directly to your mobile device, Chromebook, or computer using our free Graphical Analysis™ 4 app—no additional equipment or software purchases are necessary. Go Direct sensors can be used wired via USB or wirelessly via Bluetooth, allowing you to choose the solution best for your classroom or laboratory.